True to form, Westminster 2015 was a stunner. Am/Can. GCh. Tashtins Lookin For Trouble entered the fray with solid credentials. Campaigned for two years she finished 2014 as the #2 Hound and #9 amongst all breeds. Even so, Westminster doesn’t dole out many wins to Hounds. Moreover, Beagles had no track record at all until 2008 when Miss P’s great uncle Ch. K-Run’s Park Me in First became the first Beagle winner in the show’s 132 year history. Which brings up the real question, what took so long? That Westminster record belies the Beagle’s overall triumph in America. Charlie Brown’s comic strip sidekick is frequently mentioned as a primary reason for Beagle popularity. In reality, the breed was firmly ensconced in America’s cultural index long before Snoopy added his bullet to the charts. Recognized in 1885, Beagles entered AKC’s top ten immediately and remained there until ascending to number one in 1953. They held the position until 1959, hovered in the top ten since then, and currently rank fifth. Singularly friendly towards both humans and dogs, the Beagle’s famously merry disposition is only part of its wide appeal. Rugged, hardy and adaptable, its moderate size, visual appeal, and manageable care earned the breed unanimous approval from every sector of the dog world. Purebred commentators discussed the breed’s downward spiral well before that. The Sportsman’s Cabinet dropped the ax on Beagles in its blunt 1804 assessment, labeling the breed hopelessly old fashioned, “Previous to the present improved state of hunting and polish of field sports, packs of beagles were frequently seen in the possession of gentlemen whose age or infirmities prevented their enjoyment of sport of a different description”. Along with creaky old guys, this dismal review portrayed beaglers as, “very timid ladies and neighborhood rustics not being possessed of horses”. Writing exactly a century later, Watson offered no encouraging update on the situation. “Foxhunting became the supreme hound sport and Beagles were neglected as time went on.” Beagling morphed into the beagling tea, typically a brandy-infused ramble through the woods. These sedate social events were the antithesis of foxhunting’s edgy glamour, which became faster paced to compensate for Britain’s shrinking hunting lands. Coursing, the sport that had put Beagles on the map, nearly disappeared in Britain by the time of Watson’s 1905 Dog Book. American ingenuity and Beagle versatility, it was a match made in heaven, and unlike most imported hunting dogs, Beagles didn’t require any tweaking when they got here. Developed primarily for hare and rabbit, the Beagle was ideal for America’s varied hunting conditions and especially its cornucopia of game species. Like Prentice, British Hound authority Buchanan-Jardine acknowledged that hounds faced very different challenges over here. “Few people in Great Britain realize what a large number of hounds are bred and what a tremendous amount of hunting goes on in America.” He added that Hounds were expected to stick to the line for hours working cold trails in bad scenting country. This was the Beagle’s forte. They could be worked in packs, couples, singly as trail hounds or gundogs, in heavy, rough cover, and any weather for small or large game. In the generic sense, American hunters had utilized Beagles since the 1600s. The first Kennel Club registered Beagle stock began arriving shortly after the Civil War. “Little is known of the Beagle in America before 1876, which was about the time General Rowett of Illinois got some from England. This gentleman had on his Carlinsville farm a collection of the highest bred horses and cattle and he took the same course in getting dogs of the best stamp obtainable, so that a Rowett Beagle meant a dog of the very best type”. Watson goes on to outline the resultant bloodlines developed by Civil War veteran General Richard Rowett and his contemporaries over the next two decades. Lines like Rowett and Blue Cap established the Beagle’s purebred credentials and fueled its soaring popularity as an American hunting dog. But there was still some work to be done. Namely, the type of Beagle was in the eye of the beholder. Its drastic variations reflected its colorful, eclectic heritage. In some sense, the Beagle emerged as a breed during the Elizabethan era, the first important phase of purebred development in Britain. Among other things, the stability and economic optimism of the Tudor reign engendered a royal passion for purebreds that has remained an unshakable feature of the British monarchy. Several important breeds originated then, including possibly the most famous Beagle offshoot, the Pocket Beagle. Prentice sent some of the first imports over during this period. “The first lot of hounds I sent to America went to Mr. William Iselin of New York, the next were some I sold to Mr. James Kernochan and amongst them was Florist, which proved very successful as a sire.” Jimmy Kernochan was one of many A-List celebrities that kept Beagles in the news. His exploits with the Meadowbrook Hunt merited TMZ-type media coverage. 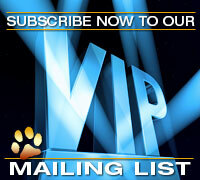 When he ran his Hempstead Beagle Pack the New York Times covered the event. 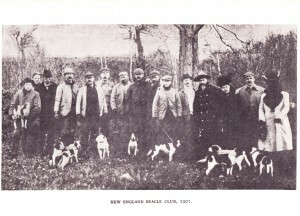 Kernochan soon had plenty of rivals as the Belmonts, Rutherfords, Vanderbilts, Huntingtons, and Roosevelts acquired major land parcels to establish private hunt clubs, dotting the land with megamansion country homes and fabulous kennels to house legendary Beagle packs like Round Hill, Thornfield, Dungannon, and Somerset. “It is rather curious to note that the sporting merits of this staunch little hound have particularly endeared the breed to our American cousins, and a writer over the water chronicles the existence of over 150 packs, kept by private individuals and mentions that there are nearly a thousand fanciers in the breed.” Compton had a hard time getting his head around these stats but had to concede that, under these circumstances, type and conformity developed at an almost miraculous pace. “Some time ago Mr. Rockefeller gave up his beagles but luckily the mantle fell on the shoulders of his brother Percy.” Percy wasn’t the only Rockefeller who remained devoted to Beagling. Most notable was Percy’s youngest sister, Ethel Geraldine, who married Remington heir Marcellus Dodge and founded the legendary Giralda Farms. In 1948 Rock Ridge Kennels made history with Ch. 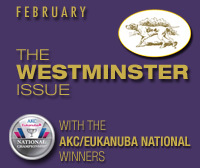 Rock Ridge Night Rocket, the only Bedlington to win Westminster. Meanwhile, it was only one major player in the Beagle game. Equally renowned was Rockefeller’s contemporary, Foxcatcher, based in Bellevue, Delaware. The New Years Day wedding of Jean Austin and William duPont Jr. was 1919’s social event, ostensibly because it united two of the era’s biggest fortunes, the duPont gunpowder/industrial chemical piggybank and the Baldwin Locomotive treasure chest amassed by Jean’s father, William Liseter Austin. That wasn’t the only interesting aspect of the alliance. It also produced one of the most powerful entities in the history of American horse breeding. Jean is best remembered for her world famous Liseter Welsh ponies, but the marriage derived from their mutual passion for horses. And for the next 20 years their shared drive, expertise, and wealth yielded many milestone achievements. Jean’s father had already established a world-class Guernsey dairy herd at the 600 acre Newtown Square estate that became the site of the couple’s new home, Liseter Hall Farm. Not to be outdone, Willie’s father provided the newlyweds with an exact replica of President James Madison’s Montpelier, Virginia plantation. (du Pont had no trouble getting the details right since he also owned the original). During the 1920s and ‘30s the couple traveled constantly to horse shows, racking up wins at the speed of light. Their spare time was devoted to foxhunting and steeplechase. Willie also served as master of Foxcatcher Hounds. Like the rest of their set, Foxcatcher’s private foxhound pack was an obligatory part of the operation. But Foxcatcher Beagles became Jean’s special focus. As the American public avidly followed the couple’s sporty escapades and jet set lifestyle, it reinforced perceptions of Beagles as status symbols and definitely kept the breed in the public eye. Beagles consistently held their own at AKC shows. For instance, Meadowlark Fearnot made history as the only Hound to win the Westminster Sporting Group in 1928, also earning placements in 1926, ‘27, and ‘29. Then, in 1930, along with the Afghan, Basset, Bloodhound, American Foxhound, English Foxhound, Greyhound, Harrier, Irish Wolfhound, Norwegian Elkhound, Otterhound, Russian Wolfhound, Saluki, Scottish Deerhound, Whippet, and Dachshund, they were moved to AKC’s new Hound Group. Foxcatcher brought Beagles to new prominence in the show ring. A major aspect of that effort was emphasizing the breed’s functionality. Foxcatcher Beagles were hunters, which entailed the usual risks that generally deterred dual purpose promotion of big winners. For instance, Ch. Foxcatcher Merryman became AKC’s 1937 Best American-Bred Hound. “The most famous 1937 winner of the famous Foxcatcher pack set a truly remarkable record as a ribboncatcher.” Noting his record of the year – 40 BOB from 40 different judges, leading to 20 Groups and 20 placements, the Gazette called, “the Foxcatchers a pack honored and cheered by every beagler. The mistress of the winning pack enjoys hunting and hound work. Ch. 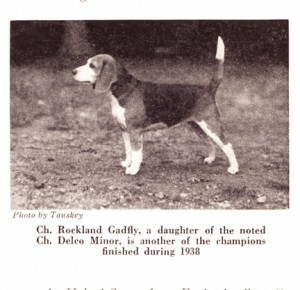 Delco Minor, the greatest winning sire of winners now nine, heads the pack famed for its quality, substance, and hunting ability.” Unfortunately, Merryman was conspicuously absent from the AKC awards ceremony due to his untimely demise. Meadowlark Draftsman seemed like the Beagle’s breakthrough Westminster winner. But it didn’t happen that time. He was followed by plenty of contenders like Ch. Kahootz Chase Manhattan, top Hound for three consecutive years with 29 all breed BIS and 130 Groups, Ch. Lanbur Miss Fleetwood, winner of 40 All Breed BIS and 120 Groups, GCh. Torquay Midnight Confession with 44 All Breed BIS and 138 Groups, and of course, Ch. K-Runs Park Me In First, who got the job done in 2008. Considering all this, the breed’s Westminster success seems long overdue. But that’s a rather narrow view of things. The Beagle has been pretty busy, piling up records in field trials, tracking, agility, and obedience, in addition to its ongoing fame as a search dog, therapy dog, and service animal. Irrepressible versatility has made the Beagle something of a renegade in the purebred world. But it’s certainly assured enduring popularity. Posted by ralbee on May 14 2015. Filed under Current Articles, Editorial, Featured. You can follow any responses to this entry through the RSS 2.0. Both comments and pings are currently closed.